One of the most anticipated shoes from Jordan Brand this month is already in the market and is absolutely gaining a lot of attention. 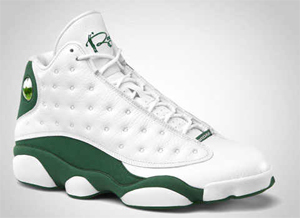 Worn by Boston Celtics sharp-shooter Ray Allen when he became the all-time leader in the NBA for three-pointers made, the Air Jordan 13 Retro is now available in White/Clover colourway, which is a “Player’s Exclusive” shoe from Jordan Brand. They are currently hitting strides in the market and you should immediately grab one for this is a very limited edition from Jordan Brand. Hurry up and get one!